Paul Walker sits with Dr. Michael Domeier and some shark fishing gear on the “set” of “Spawn of Jaws.” Image via Discovery Channel. Much of the media coverage of the life of Paul Walker, who died tragically this past weekend at age 40, has focused on his successful film career. A rare celebrity who even the gossip-obsessed never heard a bad word about , Walker was beloved by his colleagues. However, he once noted that “I’m an actor, that’s my job but it’s not my life”. Indeed, few know that in addition to being a talented actor, he had another side. He was also a philanthropist, founding “Reach Out Worldwide” in 2010 after a trip to Haiti. Walker was attending a Reach Out Worldwide event focusing on raising money for typhoon Haiyan relief when he died. Walker was able to use his fame to help the ocean and to follow his lifelong dreams. In addition to serving on the board of the Billfish Foundation since 2006, Walker aided researcher Dr. Michael Domeier in his efforts to study great white sharks. This was chronicled in the National Geographic TV show “Shark Men,” as well as the 2013 Shark Week special “Spawn of Jaws.” Walker also appeared in a shark conservation PSA during Shark Week 2013. He had the opportunity to name one of Dr. Domeier’s study animals, and he named it after his daughter. Rest in peace, ocean addict. You will be missed. Several months ago, still photographs showing an injured great white shark surfaced. The shark in question was previously captured by a shark research team lead by Dr. Michael Domeier on the TV show “Shark Men” – and the capture of this shark didn’t go as planned. 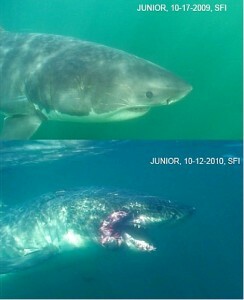 These still images were taken from a video, and in response to the ensuing controversy, Dr. Domeier’s team claimed that when the full video is viewed, you can see that the injury comes from another shark and not from capture injury. No clear sharkbite injuries are visible in the original still image. I submitted a Freedom of Information Act request for the full video, which had been in the possession of NOAA’s Office of National Marine Sanctuaries pending an investigation. Here, for the first time available to the public, is the full video from which the above images were taken.